What’s the deal with all of the Greek yogurt popping up in the grocery store? Is it healthier than the usual variety? We look at both kinds and see how the measure up against each other. Greek yogurt is thicker and creamier than regular yogurt, as it is strained to remove liquid whey. This can make it more or less attractive to you, depending on what consistency you prefer. The two yogurt types don’t vary too greatly here: Greek yogurt is slightly higher in calories, ringing in at 100 for a fat-free, plain serving, while a traditional yogurt only counts 80. Where Greek yogurt packs the biggest punch is in protein content: A serving offers more than twice the amount of protein (18 grams versus 8 grams) of regular yogurt. This is a major bonus, considering many women don’t get enough protein in their diets. It also makes it a fantastic post-workout snack for physically active folks. 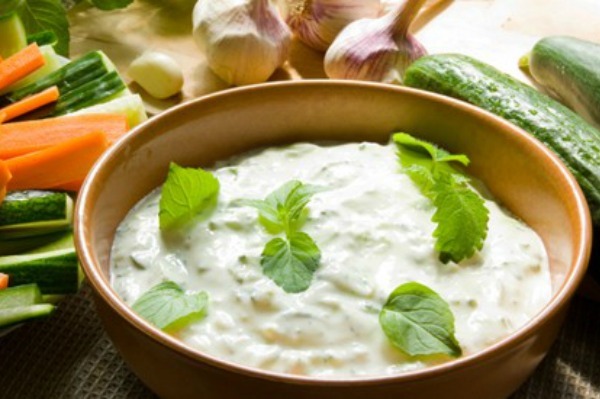 If you’re on a low-carb diet, then you should opt for Greek yogurt. A serving (6 oz. of a plain, low-fat variety) provides 4 grams of carbs while regular yogurt has 12 grams. Also, given that Greek yogurt has the whey strained out, and whey is the part of yogurt containing lactose (milk sugar), this type of yogurt may be less irritating for people who are lactose intolerant. Also, keep in mind that when you’re opting for fruity and sweetened versions of either type of yogurt, you’re also upping the carb content. Another area where these two yogurts differ significantly? Their fat content. A serving of Greek yogurt (the full-fat kind) can include 16 grams of fat, whereas a regular full-fat yogurt will have much less — closer to five grams. Of course, you can reduce the fat in either type by sticking to the low- or no-fat versions. All in all, when it comes to choosing Greek versus regular yogurt, much of it depends on what your personal preference is in terms of taste and what you’re looking to get from your yogurt nutritionally (more protein? less fat?). Both are healthy ways to get more dairy into your diet and are good sources of calcium and the good bacteria yogurt offers.